We currently have 1087 used cars for sale in Merseyside, Merseyside. 2018 (18) HOBBY Optima Deluxe T70 F 150 Automatic Lowline, Grey, Ashai/Capri, 5,000 miles. 2020 LUNAR Landstar RL S Edition Hi-Top, Grey. 2018 (68) ROLLER TEAM ROLLER TEAM PAGASO 740 S-A ROLLER TEAM PAGASO 740 S-A 2 Door Coach Built, WHITE , WHITE LEATHER, FULL MAIN DEALERSHIP , 1,050 miles. 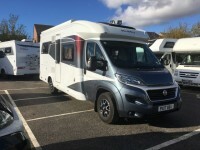 2018 (18) HOBBY Optima Deluxe T65 HFL Lowline, Slate Grey, Karelia Pine/Capri, 2,289 miles. 2020 LUNAR Roadstar TI Coach Built, Silver. 2020 HOBBY Optima T65HFL 2017MY Coach Built, Slate Grey, Karelia/Cream Leather. 2017 (67) HOBBY Optima Premium T65 HGQ Lowline, Slate Grey, Ashai/Capri, 2,979 miles. 2018 (18) HOBBY Optima Deluxe T70 HQ 150 Manual Coach Built, Other. 2017 (17) HOBBY Optima Deluxe T65 HFL Lowline, Grey, Karelia/Capri, 20,000 miles. 2017 (17) HOBBY Optima Deluxe T65 HFL 130 Manual Lowline, Grey, Ashai/Capri, 20,000 miles.